Kjeldahl Rapid infrared digestion System for Kjeldahl nitrogen determination with 6 x 250 ml, sample vessels and constant level heating timer. Fitted with a high power infrared heater. Products of FoodALYT IR are fitted with a high performance infrared heater. Quality and posi tion ing guarantee identical heating phases and digestion temperatures at all sample positions, both in single and double-row arrangements. Kjeldahl Steam distillation System, Semi-automatic version, NaOH is added and distillation started and ended at the touch of a button, Encl. set of canisters for H2O and NaOH. The Steam Distillation Units FoodALYT D are real ‘all-rounders’ in sample preparation. With these devices, proteins, nitrate, nitrite, ammonia, volatile acids, ethanol, formaldehyde etc. can be measured in different samples. determination. Steam distillation is also used to separate alcohols in spirits (e. g. egg or cream liqueurs) for later quantitative analysis. 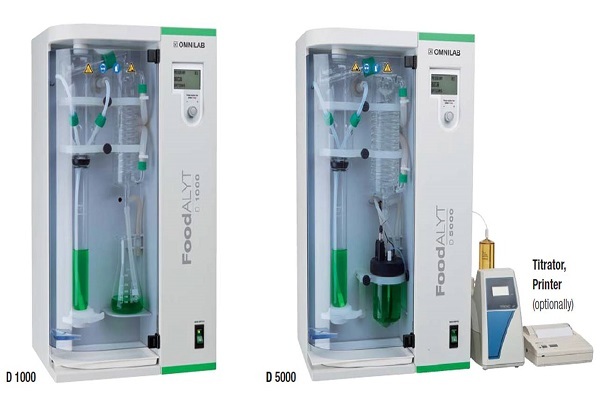 The unique versatility of the FoodALYT D units are underlined by their additional use in water and environmental chemistry for the determination of volatile organic acids (e. g. sewage sludge).